It’s not just about money. People invest in home energy upgrades for a variety of reasons, including reconstruction after heavy storms. Our new report explores their motivations and unveils, based partly on a representative survey of nearly 2,000 homeowners, the best strategies for encouraging them to invest in energy efficiency. The United States is seeing a promising upward trend in ultra-low energy (ULE) buildings. While much of this progress has occurred with new construction, it is beginning to spread to existing buildings. Over the past decade, a small but growing number of ULE building retrofit projects have been documented in more than 20 states. Ever wonder what a building thinks about its climate or the occupants it serves? Or, conversely, how the occupants perceive their building? Buildings are becoming increasingly smart; they are becoming more aware of their environment and responsive to our needs. In our new report, we discuss how smart buildings respond to, and even anticipate, changes in operation to meet energy demand and occupant expectations. Our research focuses on existing US commercial buildings of different sizes and types. This summer was a scorcher. Heat waves repeatedly struck the Midwest and South, sparing only sections of the Northeast. All of California is still in a drought. Cities were especially hot due to their concentration of buildings and human activity, a phenomenon called the urban heat island effect. At times, it may have felt impossible to beat the heat. Whole-home energy retrofits are growing in popularity across the country, but what if you are one of the more than 20 million American households that live in an apartment or condo? What if you own or manage an apartment building? 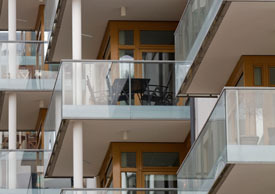 Multifamily buildings represent a large and mostly untapped potential for saving energy as traditional energy efficiency programs have focused on single-family homes or commercial office buildings.